Este tanque medio experimental se desarrolló desde finales de 1942 hasta el verano de 1944. No se adoptó para su producción en serie ni para participar en combate. This tanks performs very similarly to a T20 armed with the stock 76mm M1A1 gun, with a few extra albeit negligible features. In fact, it was designed as a successor to the T20 in real history so it is only logical that they will share characteristics. In its playstyle, it is very similar to the Comet in that it also relies greatly upon gun depression, rate of fire and flanking. 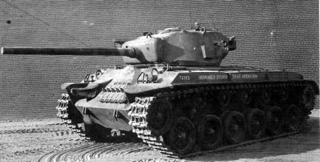 The T20 is quite a bother to drive with the stock 76mm but this issue is not present in the T23E3 as its matchmaking is limited to tier 8 and below. In common with the T20, it is quite sluggish while driving and requires some getting used to. On the move, it fires very accurately, hitting most of its shots at medium range. Overall, this tank is hard to master and difficult to drive, but in the hands of an experienced driver, it will wreak havoc.